If the students can't keep from touching one another we might as well teach them how to be safe. Story Here. From Story:Chest bumps. High fives. Hugs and handshakes. Glen Cove Middle School students Ali Slaughter and Hannah Seltzer say that's what friends do on the first day of school. But when students in the Nassau community return to school next week, the superintendent will be urging abstinence. Everyone from the tiniest tots to the biggest high school football players will be asked to limit skin-on-skin contact in an attempt to prevent the spread of swine flu when it re-emerges this fall. "It will [be hard] because you really like your friends and you didn't get to see them," Seltzer tells CBS 2. What are we learning? That abstinence prevents the spread and transmission of diseases. 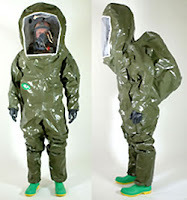 But really, let us ignore that fact and insist that all students attend class in a bio hazard suit. It could be the latest fashion trend. It can be made in different styles and sizes. Some tart of a celebrity can promote it on TV or in a music video. Twitter about it. Facebook it. Blog it. VidBlog it. Tell the President of the US -- he's all about protection. Then again, is it really fair that we force students into paranoia by scaring them about disease and then insisting that they hop inside of some synthetic suit that will really only work effectively if one has a lifestyle change (but we won't tell them about the life style change)? Makes sense to me (NOT! ).